Increasing security incidents and evolving threat models force many businesses to adopt a common approach, to supplement with additional manning and encumber the additional cost. It is believed that this increase will provide effective coverage and an effective threat mitigation plan. Our response is to provide specialist UAV security teams, rendering a reduction in manning and overall attributed cost, increasing efficiency and situational awareness, reducing response times, and improving intelligence collation. Airvis investigate the channels to provide a service that will offer you efficient, multi-role and labour saving strategies through our operational delivery. We deploy remote pilot aerial systems (RPAS) controlled and guided by security professionals, amalgamating this experience with technical capability, specific to your location, environment, and industry. Securing large complex areas with PTZ (Pan Tilt Zoom) CCTV cameras, generally demands a considerable amount of investment, and may not be viable or be the best option available. The process of evaluating the need and placement for additional systems, reviewing and processing supplier tenders, obtaining purchase orders, and commissioning the equipment (including the disruption caused by infrastructure and ground work requirements) can take months. 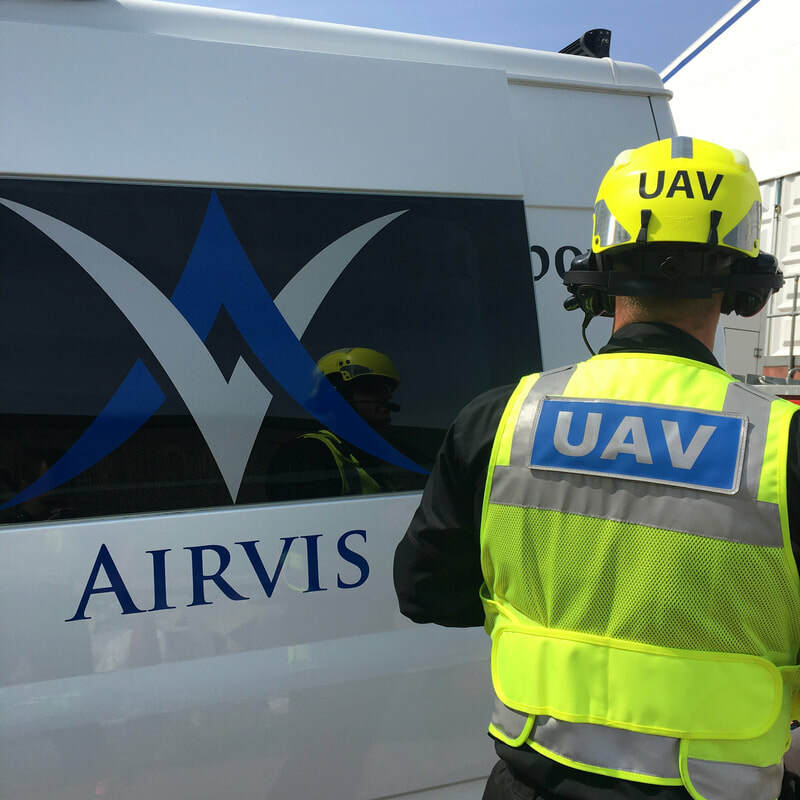 Airvis can deploy to an area within the United Kingdom within hours, providing an scalable and dynamic solution, that’s much cheaper than traditional fixed CCTV options. In today’s business, CEO’s and Directors are mostly concerned about business continuity than anything else. Protection of the brand and ensuring that a business continues to profit at minimal risk are of the highest priorities. It is therefore imperative that the threats and risk of such are fully identified and understood, so that management may implement measures to counter and/or reduce impact of such. 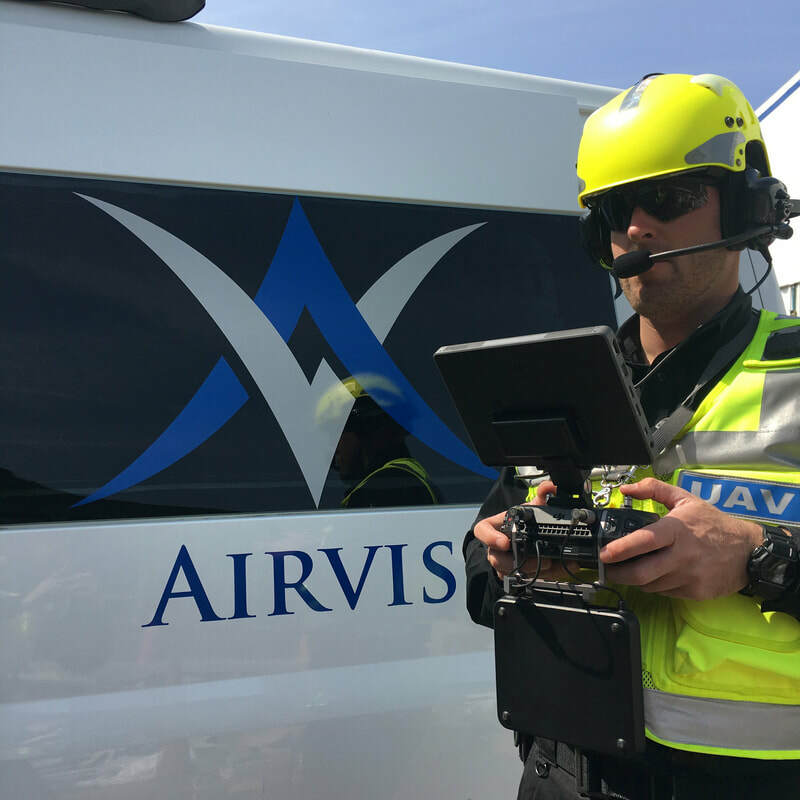 Airvis provide rapid situational awareness (previously inaccessible to the commercial/private sector) and the ability to formulate assessments on a multiplicity of incidents. A drone security team offers immediate response to potential increasing and escalating threats, limiting delays in decision making time in critical situations. It allows for rapid ‘eyes’ on target, and increases accurate and timely passage of information to key individuals whom must act quickly. Normally guards or HSE have to respond, in the first instance, to an unknown situation, putting their own safety at risk. 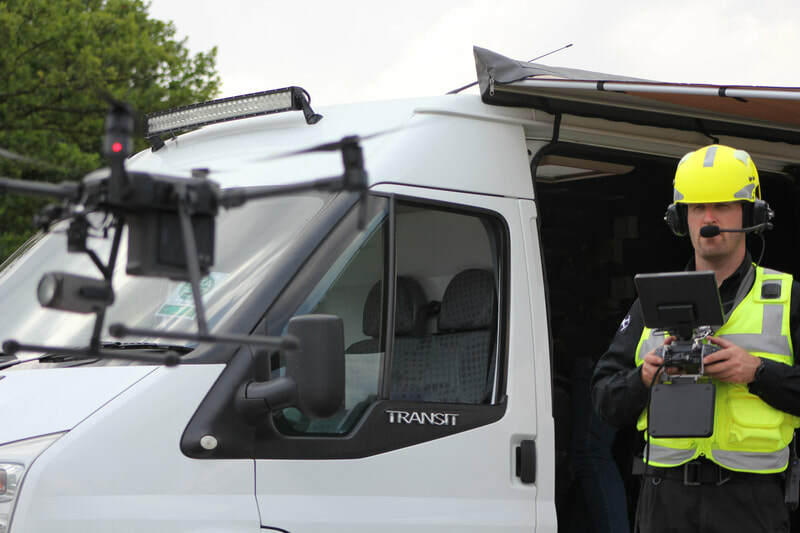 A drone security team can provide improved safety for security and other employees by classifying, and confirming a likely threat, ensuring that any required response is well briefed, prepared, justified and proportionate. The current permissions issued by the Civil Aviation Authority (the regulating body for all UAV operations within the UK) allow our pilots to fly the aircraft out to 500 meters (visual line of site), classified as our Area of Operations (AO) for the purpose of this example. Visualised by the red line. Using the mounted XT thermal imaging sensor and operating from the AO perimeter, the detection range of a man-sized target is at least an additional 500 meters, therefore 1km from the compound. Visualised by the white line. Using the mounted Z30 zoom camera and operating from the AO perimeter, the detection range of a man-sized target is an additional 1500 meters, therefore 2km from the compound.​ Visualised by the green line. Regular UAV security patrols can assist you with your daily operations. We evaluate and propose strategies to amalgamate our security provisions with business support, combining available services to add real bottom line value and savings. Offering you the capability of our drone and an experienced flight crew, as a business asset, enables your entire company to benefit from our operations. We explore synergies between our flight operations and your industry. If you provide a yearly COMAH (control of mass accidents hazardous to health) report for instance, we can assist with monitoring hazardous material, abnormal heat, gas and spills detection, 24hrs a day by embedding it into our regular security patrols, as a standard operating procedure. This creates a positive impact on your operations, health and safety procedures and very likely lower insurance premiums and conditions. Our team are accustomed with industrial inspection and can assist with the many regular inspection tasks to be undertaken on a typical industrial site. For example, simple visual checks, pollution risk reviews and thermal inspections. We can provide access to areas that are too difficult or too risky to send personal into. These services can dramatically reduce the risk exposure in a “working at height” situation and by altering the economics of these inspections, allows you to conduct them more frequently. 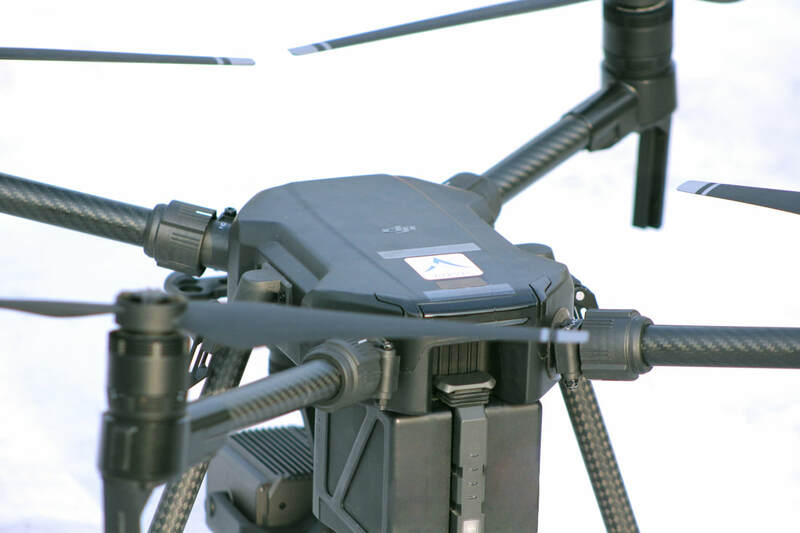 ​By definition, an inspection by a drone has a record, the output from the camera or sensor payload. The fact that this exists and can be stored for future reference can also be a key enhancement to inspection regime. With an airborne surveillance asset, you have a limited footprint on the ground. A foot, or mobile team is affected by one-way systems, speed restrictions, traffic calming measures, out of bounds areas and sensitive and difficult terrain, all hindering the capability and effectiveness of the response from the ground based security personnel. These prohibiting factors do not apply to our drone security teams.